The timeless classic “It’s a Wonderful Life” is essential viewing for the Christmas season. It’s the life story of humble family man George Bailey who, throughout his life, gave more than he received, and in the moment of deepest despair is allowed to see the effects of his goodwill. Though known as a holiday film, it’s a perfect piece of cinema on its own and one of the greatest films of all-time. There are several existential themes that run through the film which make it so accessible and watchable. Capra and his writers give us a full hour and a half of story before revealing the heart of the film. We see George at benchmark moments in his life when his selflessness has furthered the lives and careers of others. There’s his brother’s sledding accident which saved his life but caused irreparable damage to George’s ear; Before going off to college George stays in the town he desperately wants to leave so he can bail out his father’s old Building Savings and Loan business; On the day of his wedding George forgoes his honeymoon so he can stem a potential bank run against the business – and personally loans $2000 from his own savings to help the community. But most importantly he sacrifices he hopes and dreams of becoming an engineer in order to help his community from falling under the monopolistic money baron Mr. Potter. These events are carefully written and planned out in the screenplay so they will pay off in the famous third act which most of us are familiar with. The angel we heard talking to us at the beginning of the film comes to earth like the ghost of Christmas past to help George see the good he has brought his friends and family. The film is existential because despite the divine intervention it’s George’s direct and indirect actions in his life which ultimately save him from financial ruin. Though the benign angel Clarence allows him to see the effect of his goodwill on the community there is no magic button or pixie dust thrown into the mix. The revelation and resolution are not religious, or a miracle, instead the result of a life’s work of goodness. In many ways the film is also a direct shot at extreme free-marketism. Bailey’s credit union battles Potter’s evil economic takeover throughout the film. I’m surprised the film wasn’t blacklisted because the allusions to socialism are clear. Frank Capra though is such a talented filmmaker that his righteousness and common wholesomeness trump any economic or political agendas. 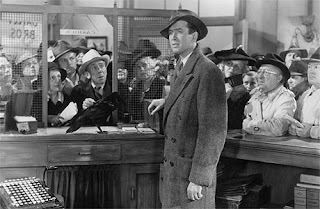 “It’s a Wonderful Life” is timeless not because of its Christmas themes but because there’s a bit of George Bailey in every one of us - his dreams and aspirations and his guilt, insecurities and neuroses. And the purpose of the film is not to spread Christmas cheer but to make the audience look inward and rediscover their own personal faith in humanity and the value of the smallest seemingly insignificant actions in our lives. Such optimism is rare for films today. Merry Christmas.